The Suez Canal is a busy waterway that links the Mediterranean and Red Seas. The Canal was dug largely by hand from 1859 to 1869 at the cost of 125,000 Egyptian lives. It has been the scene of several wars between Egypt and Israel during which all the bridges crossing the canal were destroyed. 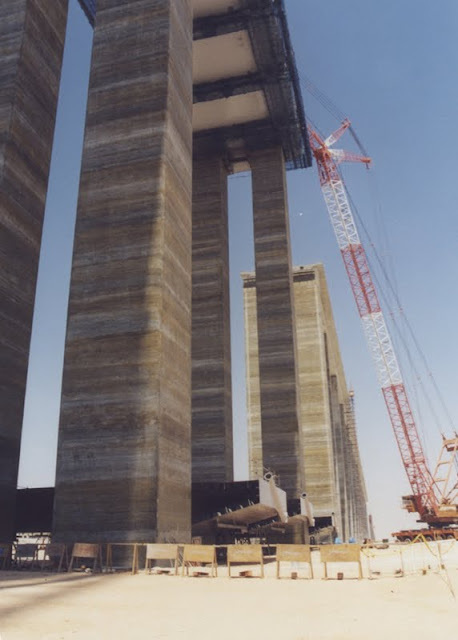 In June of 2000, I was taken on a construction tour of the first new bridge to cross the Suez Canal by my friend Professor Haroun from the American University in Cairo. The Suez Canal (Peace) Bridge is a cable-stayed structure initiated as a grant from Japan's Development Assistance Program in order to open up the Sinai for development and to bring Egypt and Israel closer together. It is located at Qantara about 49 miles south of Port Said and 38 miles north of Ismalia. The main span is 70 meters above the canal and 404 meters across the canal to allow the largest tankers and container ships passage through the canal. The side spans are 163 meters long and there are two very long approach spans to allow truck traffic to slowly climb onto the cable-stayed bridge. The main spans were designed by Choddai Consultants and the approaches were designed by Pacific Consultants International. The main spans are steel box girders with a steel (8 m wide) deck. The approaches are 40 m. long, cast-in-place prestressed box girders that are continuous for seven spans. The reinforced concrete towers are 150 m high and supported by cast-in-drilled-hole piles (as is the rest of the structure). Nile Contractors are building the west approach, Nippon Steel, Kajima, NKK Corporations are building the main spans and towers, and Arab Consultants is responsible for the east approach. Because the construction was done by both Japanese and Egyptian Contractors, the plans and specifications were written in English. The construction of the east approach in the Sinai was made difficult because there were no facilities like clean water or electricity. Moreover, the site was covered with spoils from digging the canal. In fact, Hamza Engineers eventually recommended that the east approach be lengthened several spans since the loose alluvium couldn’t support a tall abutment. Another problem for Arab Contractors was the removal of land mines laid by Egypt and Israel during the last 50 years. Because the bridge is so tall, falsework couldn’t conveniently be built to support the forms on the approaches and so a ‘flying shuttering system’ developed by Thyssen was used for segmental construction of the west approach. A truss is supported and incrementally moved along adjacent piers and the cured concrete girders. The truss supports forms that are quickly removed and pushed to the front on rails. A mixing plant on the site supplies all the concrete for the piles, piers, and superstructure. The steel superstructure was built in Japan and brought on-site in short segments, lifted into place, hung from cable-stays, and then welded to the previous segment. The main towers were carefully designed to resemble the columns of a pharaonic temple at Karnak. Currently, tunnels and ferries are the only means available for crossing the canal. However, the ferries interfere with navigation along the Suez (there was a constant stream of cargo vessels moving along the canal while I was there). A new movable railroad bridge was also under construction across the canal near Qantara while I was there. The Sinai is sparsely populated and the Egyptian Government is eager to develop it. Moreover, there is currently little commerce between Israel and Egypt and it is hoped that this bridge will facilitate a more lasting peace based on shared mutual interests between the two countries. In fact, this project will help to link Europe, Asia, and Africa through new highways being completed around the Mediterranean Sea. This unique bridge project was completed in 2001. Cable-Stayed Bridges: Suez Canal Peace Bridge by Mark Yashinsky is licensed under a Creative Commons Attribution 3.0 United States License.